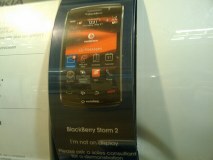 BlackBerry, the sequels - Storm 2 and Bold 2 coming soon? 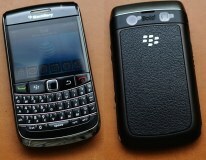 Two BlackBerry handsets are inching closer to release - the BlackBerry Storm 2 and the Bold 2. After much leaking there's still nothing official on either of those phones. But the Internet rumor mill is beginning to lean towards "coming soon". First up, the BlackBerry Storm 2 - we've seen photos of it and even videos demonstrating its amazing clickable screen powered by piezo-magic. The omens of its imminent coming are a Vodafone display snapped at the Carphone Warehouse plus a spy-ninja style blurry Verizon training video. The preliminary info of what's in the box says 16GB microSD card (plus 2GB internal) and BlackBerry OS 5.0. The other soon-to-arrive Berry, the BlackBerry Bold 2 (code-named Onyx), is set to become the BlackBerry corporate flagship. It trades the traditional trackball for a touchpad and offers 3G, Wi-Fi and GPS, not to mention it has some really nice looks. A tipster also let Engadget in on an announce date for the Bold 2 - October 21st. October 21st can't come soon enough, can it? Prices, plans, even a release date are still a mystery however, so do count on coming home with one in two weeks. Same goes for iphone, if one is used to using iphone he cannot use another phone.